Imagine your best birthday ever. Even if there was more cake than you could possibly consume in one sitting, Tanya Taylor has you beat. That’s because on December 10, First Lady Michelle Obama wore one of Taylor’s frocks to a holiday party—the same day Taylor turned 31. For a designer, it doesn’t get much better than that (especially since Beyoncé, Jessica Alba and Sophie Grégoire Trudeau are already fans). 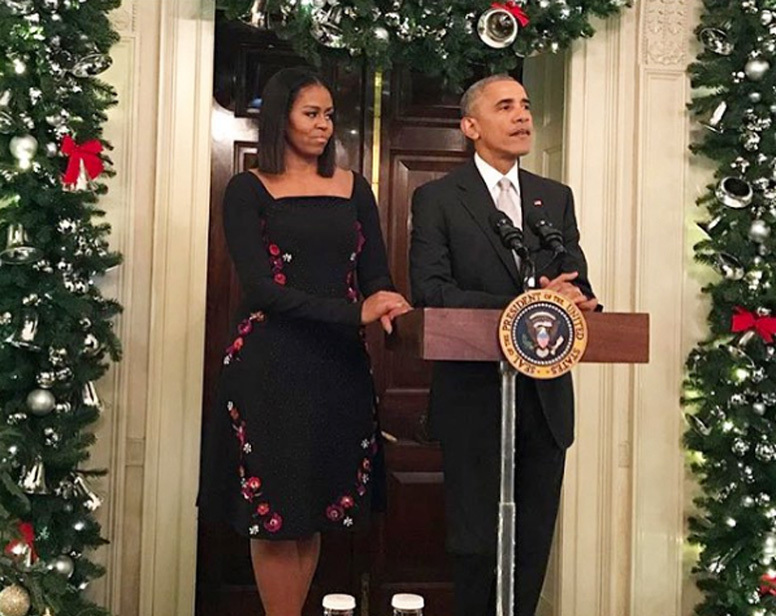 “When it’s your birthday and #MichelleObama wears you for her final #WhiteHouse holiday party it’s a really really good day,” Taylor said on Instagram. The designer grew up in Toronto and studied finance at McGill before launching her colourful line in 2012 in New York, where she is currently based. Obama, who stunned in a long-sleeve black dress embroidered with flowers along the side and a blunt bob, has worn Taylor’s sheaths before, the first time being in 2014. But when something like this happens on your birthday…now that’s a special gift. The style worn by Obama isn’t available online, but similar styles can be viewed on tanyataylor.com.